This year was different in so many ways with Christmas. Turns out that it was wonderful in every way. When I walk from the lounge to the kitchen, I have to go through the dining room which is not really a diningroom, but anyway - that's where the Christmas Tree is. I was going to take it down this past weekend but then I thought of a friend who said she loves to sit in the lights of the tree in the wee hours of the morning, and I started looking at this tree differently. 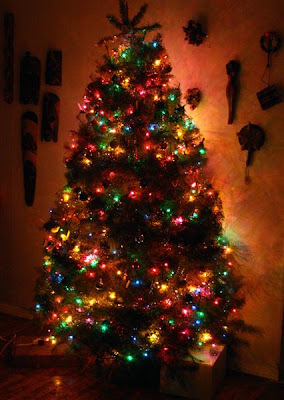 So every day, I switch the lights on the tree and each time I walk past it I really, really enjoy it. All of those 'gifts' hanging in the tree has also brought such a good feeling - they glisten in the lights giving out stars of hope..... Each person who has touched me in this journey of cml, has been a gift to me which is why I picked them to hang there. For so many years, a Christmas Tree was lovely, but it just marked a time of the year in my life. So many Christmas trees were packed away or thrown out with relief in getting my space back again, getting life back to normal and so on. This year - the taking down of the Christmas Tree will be marked with a certain amount of sadness - I know I will miss it and all it meant to me this time. I will miss the thoughts and peace and hope that came from this tree. As I am writing this, I realise that a Christmas Tree 'should' bring thoughts of God and or Jesus to mind - but I have to admit that the overriding thought and feeling that it gives me is love. Is this not close enough? What do I wish for this new year that is about to hit us all squarely in the face? Well, I wish that the days are filled with knowledge that we are loved, knowledge that we are treasured. I wish that the days are filled with Peace - peace about what has passed and peace about what this new year will deal out to us all. And definately that the days are filled with Love. Love that comes from family and friends, strangers and God. Love that will wrap around us all and keep us warm in the storms that are sure to rage - and love that takes our breath in the good and wonderful times. I wish for many wonder-filled days.